Had a bit of a meetup with my old high school friends a few weeks ago. It was freezing that night, complete with bursts of rain and gale-force winds and everyone (save for L and M?) showed up wearing a black leather/pleather jacket of some sort. We decided to go to the food court at Pitt St Westfields, being unable to choose a restaurant. I hadn't been up to the food court and was frankly astonished to see the place decked out in black marble tiles and black leather chairs. It's definitely a nice place to eat with friends - a high end food court? - and there's quite a variety of cuisine to choose from. is 'not as good as it's hyped up to be', but I found it pretty delicious. Maybe because it was cold and windy and we were all in desperate need of comfort food. The bun was a bit oily, true, but the chicken was cooked well and I enjoyed the coleslaw and tomato. It's a bit exorbitant - I think it was $12? - but definitely filling. 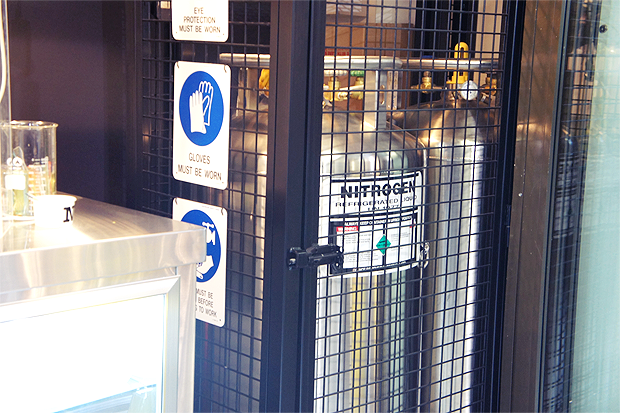 N2 gelato is basically gelato made with liquid nitrogen, the obligatory requirement in any mad scientist lab. I didn't buy an ice-cream so I can't attest personally but, according to friends, the gelato was 'denser' than normal ice-cream and more flavoursome (the strawberry cheesecake actually tasted like cheesecake, apparently), presumably because they don't need to dilute the ingredients with water and milk in order to freeze it (science! Used to answer the important questions in life). It seemed to melt a bit faster (or just is more 'mushy') than normal ice-cream, though it was a freezing, gale-force-winds night (perfect for ice-cream eating!) so I'm not sure how it'll fare in summer heat.